We are always interested in hearing from people with BHD syndrome. If you would like to write your own personal story for this page, get in touch at contact@bhdsyndrome.org. If you know that someone in your family has BHD syndrome, it is very important that you consider getting tested yourself. Here Karin shares her experiences of BHD syndrome. My name is Karin Guthrie. 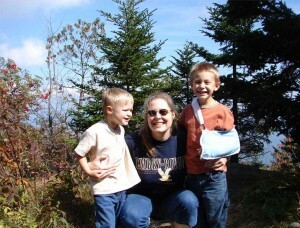 I am a BHD cancer patient and a 40-year-old mother of two little boys. My Birt-Hogg-Dubé inheritance came from my father. He was in the original BHD study through the National Cancer Institute at the National Institutes of Health in Bethesda, Maryland, along with his sister and two brothers. Dad was referred to the study while visiting a dermatologist who noticed his fibrofollicullomas, the tell-tale spots of BHD, on his face. All 4 tested positive for the genetic disorder, and one of my uncles had previously had a malignant tumour removed from his kidney. My cousins and siblings were advised at the time to get tested, but I ignored the warning. In my early 30’s I noticed a couple of the spots on my face, just like Dad. I figured I probably had BHD, but didn’t concern myself with testing as I was afraid there would be future insurance problems if it had been confirmed. In September, 2007, I went in for an abdominal ultrasound from some pain I’d had for about 48 hours, which turned into two CT scans and phone call that I had a mass on each kidney. I just knew in my heart what I had and that BHD was involved. Later it was confirmed that I had bilateral clear cell renal cell carcinoma, grade 4. Of the clear cell varieties, that is the most aggressive. Surprisingly, the pain I had turned out to be my irritable bowel syndrome, so my finding was incidental. I was immediately accepted into the BHD study at NCI in Bethesda because of my diagnosis and family history. In November I had a left-side partial nephrectomy and have healed well. I never had any cancer symptoms, as I’ve heard is the case with most kidney cancer patients. Of course I have run through a hundred thoughts and emotions, as well as dozens more you wouldn’t know about unless you actually get cancer. It is especially tough if your kids are so small. Fortunately, I have great medical care, get frequent scans and tests, and have the support I need through God, my family and amazing friends. Cancer is definitely not the end, and I look forward to every day with the people who mean the most to me. Even in the same family, a BHD mutation affects each individual differently. Many initially notice the skin lesions (fibrofolliculomas), which can look like a rash. Below, Allison shares her family’s experiences with BHD syndrome. People in my family who have been diagnosed with BHD so far include my father John, my brother Alfie, & my sister Roma. My brother Johnny has the rash exactly the same as the rest but refuses to take it seriously, so won’t be diagnosed. All except Johnny see Dr. J. Alderdice, a dermatologist. It was him, as well as further tests, who diagnosed it first in my brother Alfie. I’ll write a story about each, how they found out, etc. Has had the rash for quite a few years. It was thought at the time it was a reaction between his medication and the sun’s rays, so nothing was ever done about it until now. In hindsight, all the clues were pointing to BHD. My father has had bowel cancer and also had a pneumothorax during surgery for a heart bypass; this could also be explained by a bit of his rib cracking and puncturing his lung during the surgery. The vain one wouldn’t stop from the day he started to get the rash a few years ago, until now really, to get rid of it. He has had 2 pneumothoraxes. His rash on his face is quite bad; it’s now on his neck, traveling down to his trunk. He was offered laser treatment, but the treatment was a long way away, with 2 train rides and a taxi and bus ride – only to be told that if he got the sun on his face after laser treatment it would look worse. So he kicked that idea out the window. It seems to have hit her worse. She had the rash and Alfie told her what it was. She went straight to her GP, was then referred to a dermatologist and was diagnosed with BHD. Like the others, she has had all the tests she could have on her bowels, lungs, etc. She has 4 kids and feels bad for them as you know they could all have the gene too. She has had chronic asthma since she was little, so with lung problems already, it’s hard for her. She has had several courses of steroids recently. I was advised to go see my GP about screening – easier said than done! I was first met with the idea that I could have my mum’s genes, so would be ok – so no referral to anyone. Then I went back and said I need to be put forward for screening. I was referred to Professor Maher at the Birmingham Women’s Hospital Genetic Counselling service. I’m just waiting now for an appointment. It’s the not knowing for me that makes it hard. I have got a few small white lumps under the skin on my nose that have been there for a few months now. They neither grew much or disappeared, so I don’t know. Having said that, my siblings are 10 years or more older than me, so they’ve all started into their 4th decade. I’ve just started my 3rd. I keep looking at my kids – being so positive – but then I think of the possible problems I could have placed on them. My idea is to take it one step at a time. I have a very supportive husband who is behind me no matter what happens, and that way I won’t be facing the unknown alone. We have heard from several people who have had clinical diagnoses of Birt-Hogg-Dubé syndrome on the basis of their matching symptoms. Many were diagnosed before the cause of BHD syndrome was recognised. Now that the BHD gene has been identified, these people can go back and be tested for known BHD mutations. As of 2011, there are approximately 91 disease-causing mutations in the BHD gene. However, what do people do when they have no identifiable BHD mutation – but still have all the symptoms? How does this diagnosis affect their lives? First off, I have been living with the title of “Birt-Hogg-Dubé syndrome” for 14 years. Two kidney cancer surgeries and now a 3rd diagnosis of kidney cancer. Clinically, I am confirmed as “Birt-Hogg-Dubé” but molecularly the blood results from Bethesda came back NEGATIVE. So, the question is WHAT AM I? Researched via imaging CT scans and MRI’s for possible Multiple Myeloma in 2006-2007. Result: No confirmation of Multiple Myeloma. No cancer is present at this time. Follow up’s in 6 months via CT scan and then in 1 year if all goes well. Cystic breasts with lumpectomies performed over the last few years. All of them benign except for one which showed a tiny, tiny, microscopic invasion outside the duct. Hence, I am listed as having had breast cancer. No treatment was ever received. A radical mastectomy was recommended. My surgeon at that time and myself agreed for the amount there was present we would not do surgery. This was almost 10 years ago. Lupus or acute thrombocytopenia and anti-phospholipid syndrome and osteoporosis. Degenerative disc disease in my neck. Small mass the size of a dime is in my neck between C5 and C6. This cannot be removed as the location of same with surgical removal will cause paralysis. This was discovered 1 1/2 years ago. Molecularly the result [for BHD syndrome] is negative. I have gone back as far as I can to trace the genetic carrier and have come to the conclusion the carrier was my Mother, as she and I were both diagnosed with kidney cancer the same year.